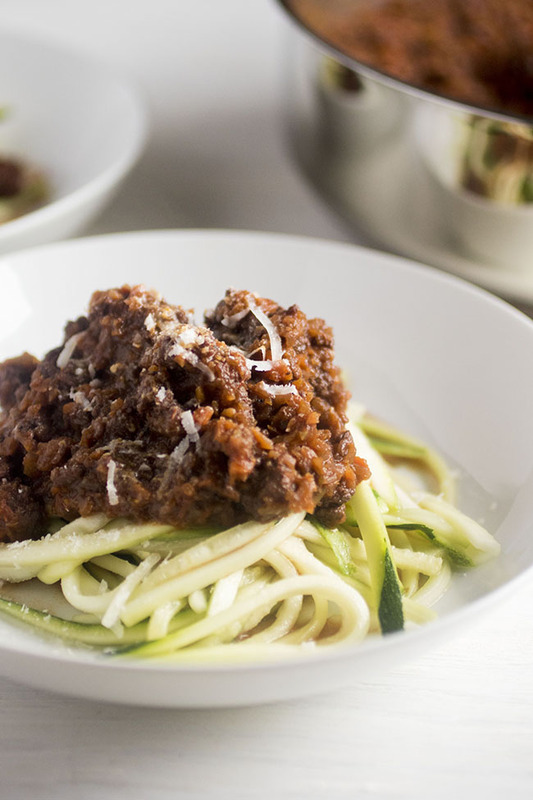 Lighten up a classic bolognese recipe with this easy zucchini noodle bolognese! Hello, my name is Jessie, and I like to jump on bandwagons. I can’t help it, you guys. It was the interwebs! They got to me! All these trendy bloggers with their trendy spiralizers and their trendy “health foods” (<– blergh, whatever, #CUPCAKES4LYFE) and their trendy trendiness and their trendy “I promise you it tastes really good!” and blah blah blah. I caved. I jumped. I bandwagoned HARD. And I am actually, for-realsies, 100%, this-is-not-a-joke showing you a pasta recipe with fake noodles today. A squash in carbs’ clothing. We’re talking – *gulp* – zucchini noodles. Have you gotten into this whole “zoodle-noodle” thing? Tell me all your zoodle feelings! (Side note: it just took me ten tries to type “zoodle” because my computer keeps autocorrecting to “noodle” and then refuses to let me UN-autocorrect because even my iMac knows how completely unnatural this whole situation is). (Other side note: Pretty sure I’m not cool enough to pull off the word “zoodle”). On one hand, I don’t get it at all. On the other hand, I TOTALLY GET IT. You know? Liiiiiiiike…why would anyone want to eat zucchini when there is pasta in the world? But also, you can’t eat pasta for every meal of every day of forever – but if you use zucchini noodles, you kind of can? Because…health food? To make a long story longer, I made some zucchini noodles. And then I made some MORE zucchini noodles. And then another batch after that. And now, suddenly, a few months later, this is, like…a thing that I eat. It’s a sauce made with vegetables. On top of a vegetable. (SHHHH about zucchini having seeds and really being a fruit. We’re going for dramatic emphasis here). Also, this bolognese is just TASTY. So zoodle-noodles or not, we need more of this sauce in our lives ❤. 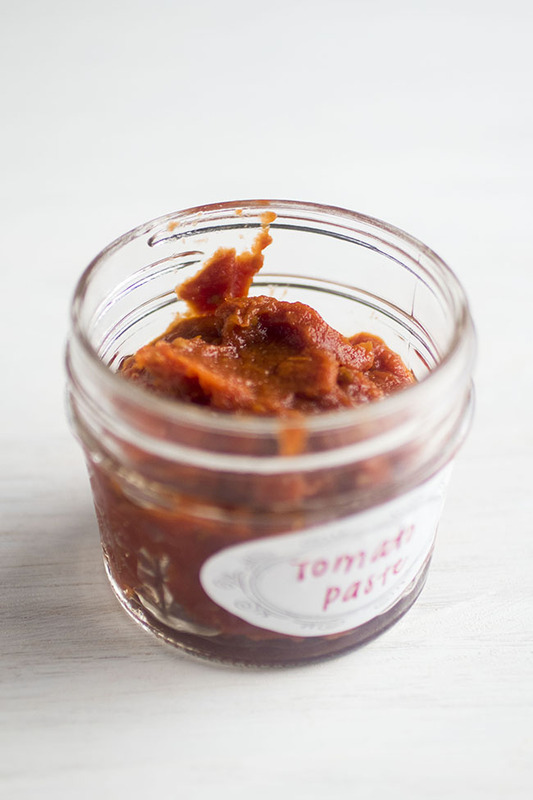 This is a pretty standard bolognese sauce – carrots, celery, onion, garlic, tomato paste, WINE, ground beef. Feel free to add some fresh chopped parsley or basil if you have any on hand, or swap sliced portobello mushrooms for the beef to make this a vegetarian version. 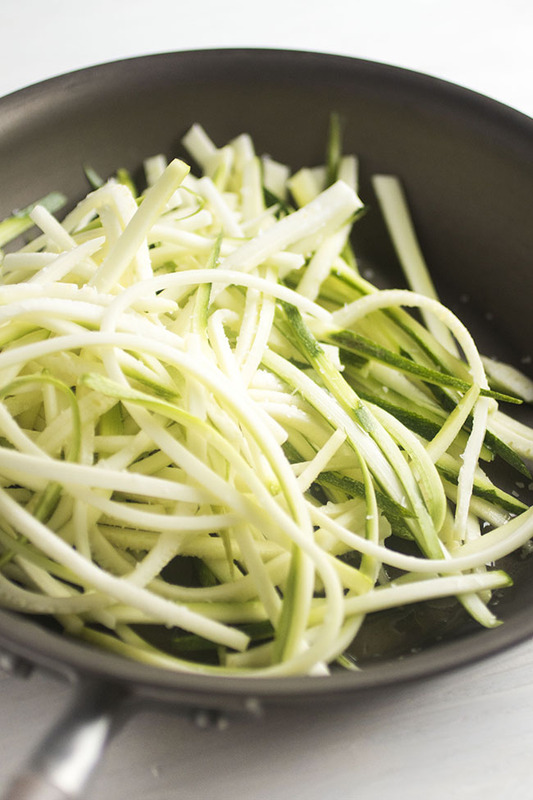 If you don’t have a spiralizer, zoodle-ify your zucchini with a julienne blade on a mandolin, or slice it into tagliatelle-like strips with a vegetable peeler. I’m spiralizer-less, so I just use my mandolin – but it works fine! I honestly don’t know if I’ll even bother buying a spiralizer (my kitchen is FULL), but if you’re in the market for one, my blogger friends have been recommending the Paderno or The Inspiralizer. I DO love that spiralizers create long, curly noodles as opposed to just slices. SO FANCY. (UPDATE: Two months after this post went live, I caved and bought this spiralizer. And I’m obsessed with it). Have you tried a spiralizer before? How did you like it? Tell me everything! 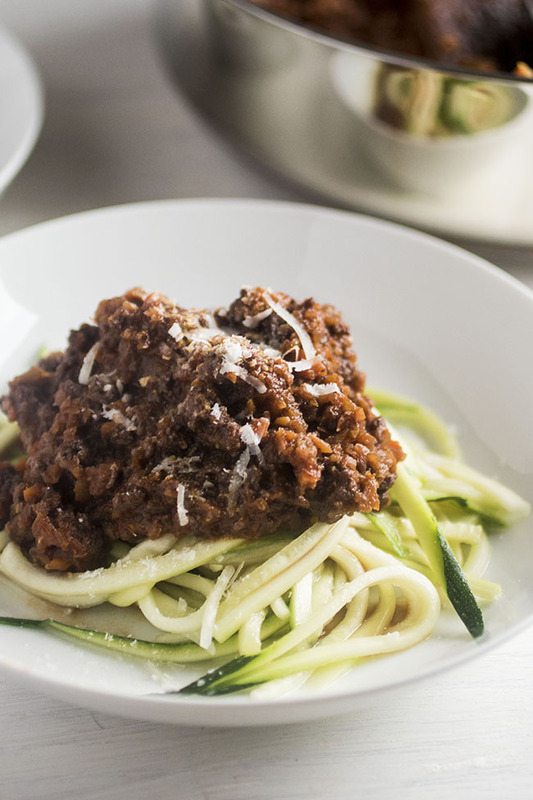 (And then make this zucchini noodle bolognese). 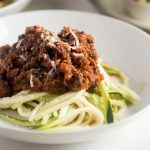 Easy spiralized Zucchini Noodle recipe with homemade bolognese sauce. 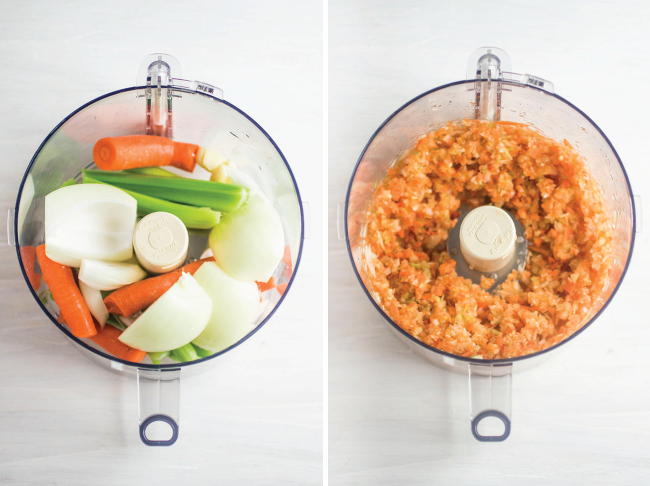 In a food processor, pulse carrots, celery, garlic, and onion together to chop everything into very small, fine pieces – it should look kind of like you’ve grated everything through a very small cheese grater. In a large, flat-bottomed saucepan or dutch oven, heat olive oil over medium-high heat. Add your carrot-celery-onion mixture to the pan and sauté – stirring only occasionally – for 10-15 minutes until veggies have softened and started to brown. Add salt, pepper, and ground beef to pan and break the beef apart with a spoon or spatula. Sauté for another 10 minutes or so, stirring occasionally, until beef is cooked through and lightly browned. Add the remaining red wine and the bay leaves and stir to combine. Reduce heat to medium and bring mixture to a simmer. Cook until wine has reduced by half, about 15 minutes. When wine has reduced, add 1 cup of water and stir to combine. Bring the sauce back to a simmer and cook until water has reduced by half, about 20 minutes. Add the last cup of water to sauce and stir to combine. Bring back to a simmer and reduce the liquid by about 3/4 (you want a relatively low liquid content because zucchini contains so much water). This should take about 25 minutes. While the sauce reduces for the final time, slice or spiralize your zucchini. I use my mandolin fitted with the smallest slicing blade to get noodle-like slices, but you could also use a spiralizer (<–affiliate link). Heat a large skillet over medium heat and add the zucchini noodles and a pinch of kosher salt. Cook for 1-2 minutes until zucchini has just begun to soften, then transfer noodles to a colander and let them drain for a few minutes while you finish the sauce. I find this quick pre-cooking helps release some of the water in the zucchini so they’re less soggy (but still taste al dente!) and don’t release too much water into your bolognese sauce. When the sauce is ready, remove the bay leaves and discard. 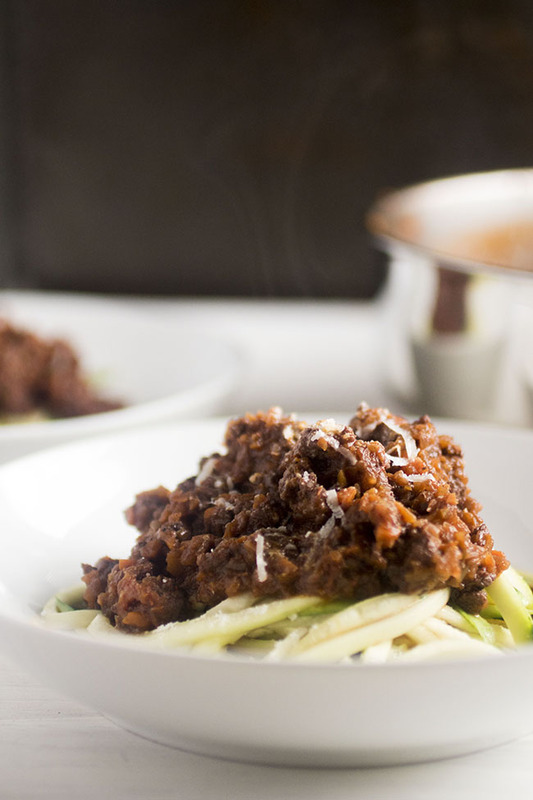 Place drained zucchini into serving dishes and top with bolognese sauce. Top with parmesan cheese and serve immediately. Not a zucchini noodle fan? Use regular spaghetti! For a vegetarian option, swap sliced portobello mushrooms for the beef in this recipe. Zucchini noodles release a lot of water, so make sure you’ve drained them as instructed in the recipe before serving.